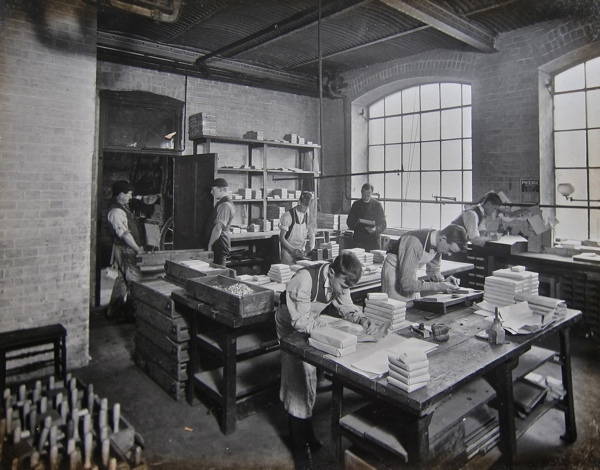 While researching the work of William Caslon, the first British type founder, whose Doric & Brunel typefaces, newly digitised by Paul Barnes, are being used by David Pearson in The Gentle Author’s London Album, I came upon this wonderful collection of photographs of the Caslon Letter Foundry in the St Bride Printing Library. 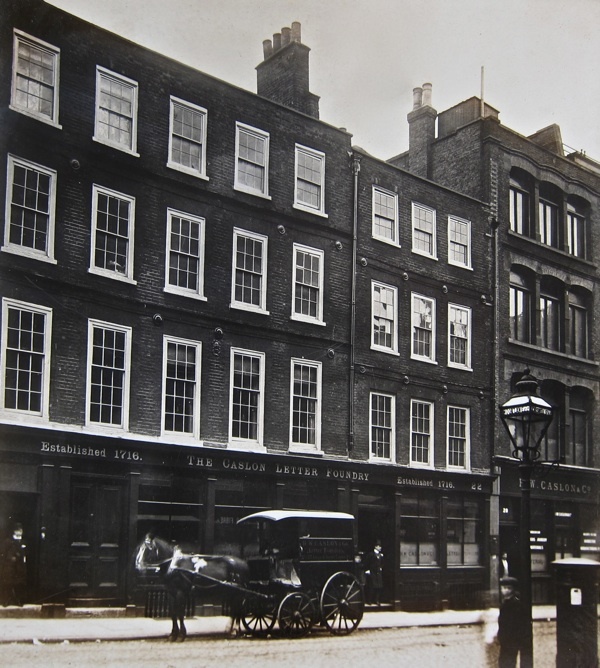 William Caslon set up his type foundry in Chiswell St in 1737, where it operated without any significant change in the methods of production until 1937. 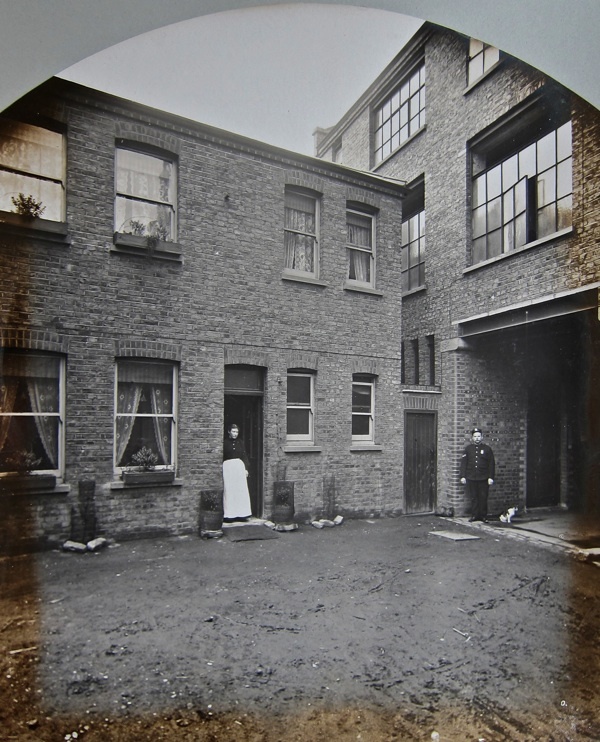 These historic photographs taken in 1902, upon the occasion of the opening of the new Caslon factory in Hackney Wick, record both the final decades of the unchanged work of traditional type-founding, as well as the mechanisation of the process that would eventually lead to the industry being swept away by the end of the century. 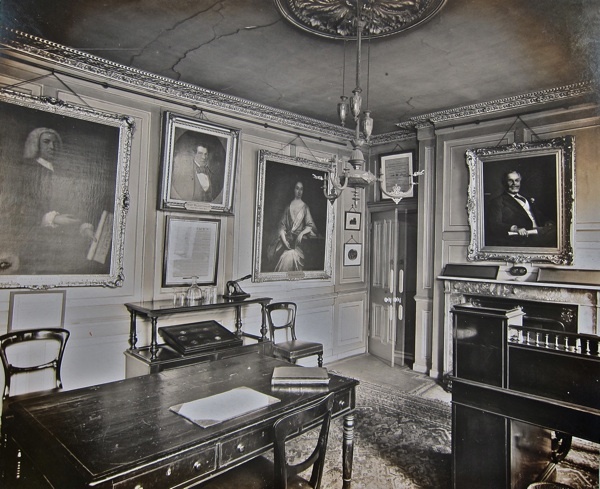 The Directors’ Room with portraits of William Caslon and Elizabeth Caslon. 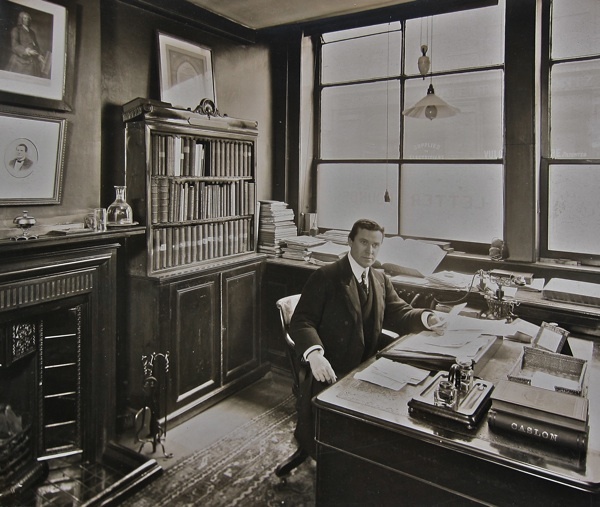 Clerks’ office, 15th November 1902. A woman sits at her typewriter in the centre of the office. 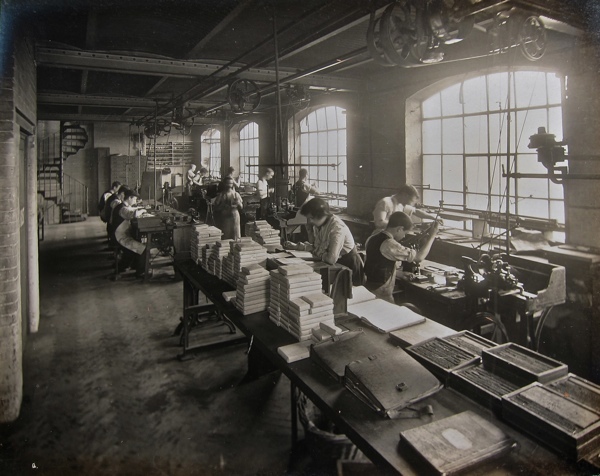 Type store with fonts being made up in packets by women and boys working by candlelight. 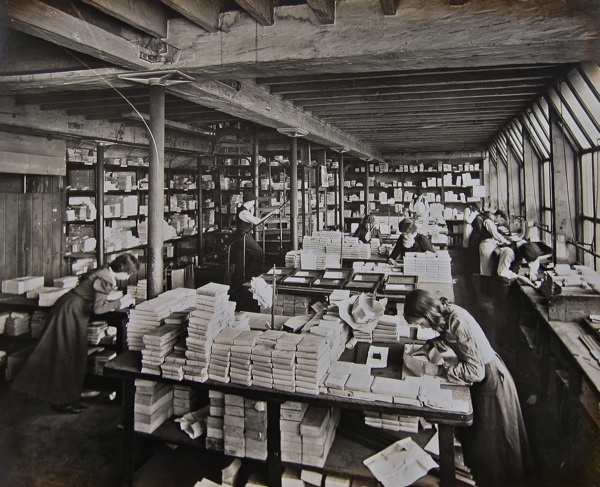 Another view of the type store with women making up packets of fonts. 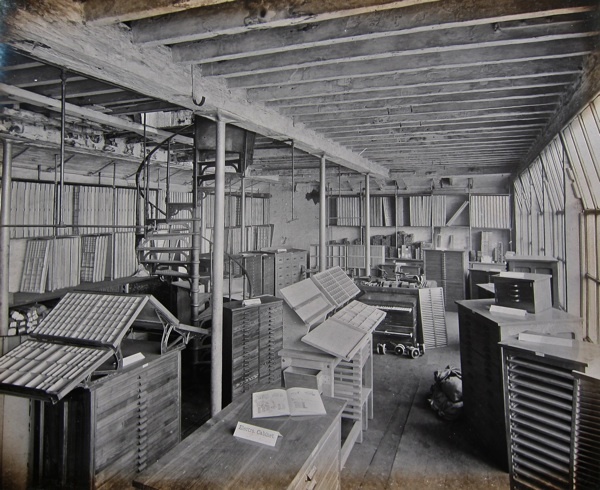 Another view of the type store. Another part of the type store. 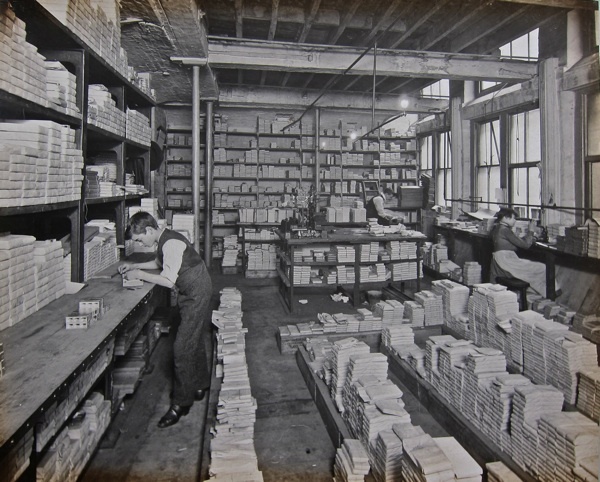 A boy makes up a packet of fonts in the type store. 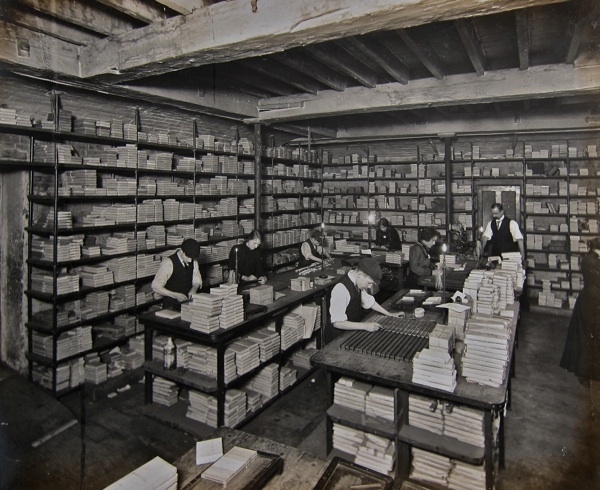 Room of printers’ supplies including type cases, forme trolleys and electro cabinets. 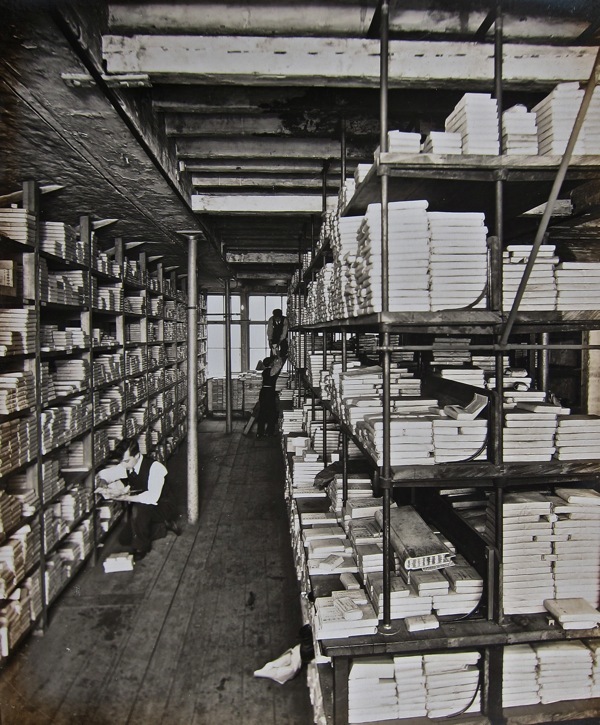 Another view of the printers’ supplies store. 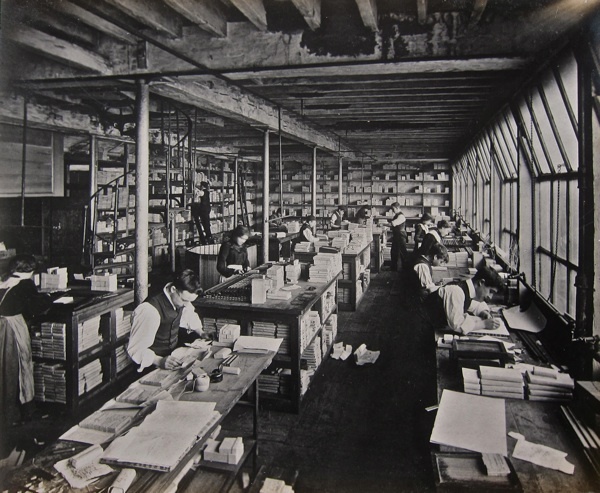 Printing office on an upper floor with pages of type specimens being set and printed on Albion and Imperial handpresses. 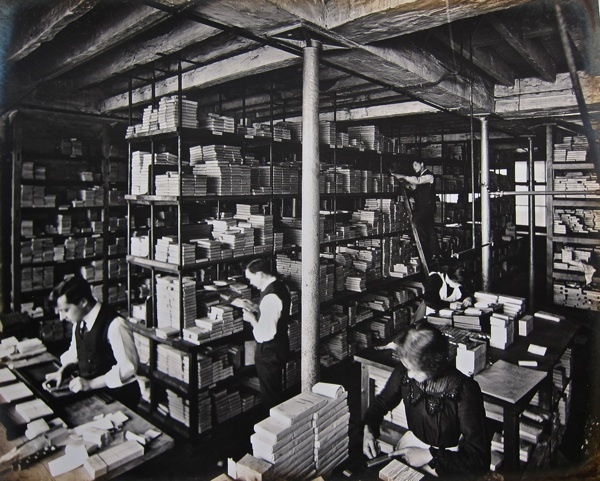 Packing department with crates labelled GER, GWR, LNWR, CALCUTTA, BOMBAY, and SYDNEY. 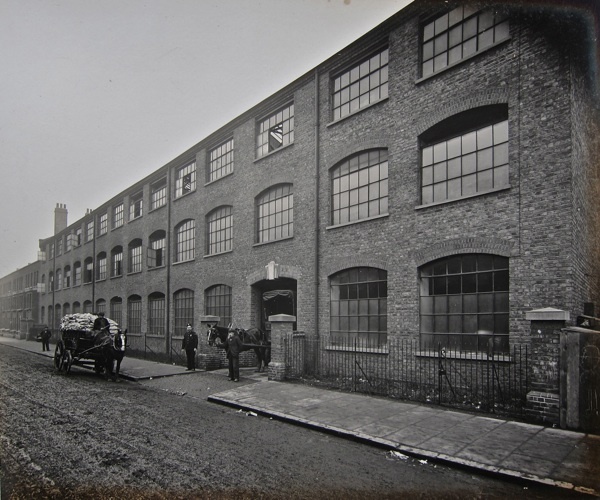 New Caslon Letter Foundry at Rothbury Rd, Hackney Wick, 1902. 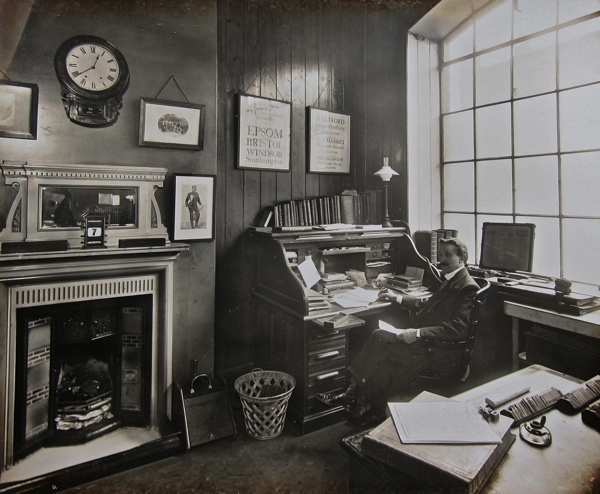 Harold Arthur Caslon Smith at his rolltop desk in Hackney Wick with type specimens from 1780 on the wall, Friday 7th November, 1902. Machine shop with plane, lathes and overhead belting. Gas engines and man with oil can. Lathes in the Machine Shop. Hand forging in the Machine Shop. 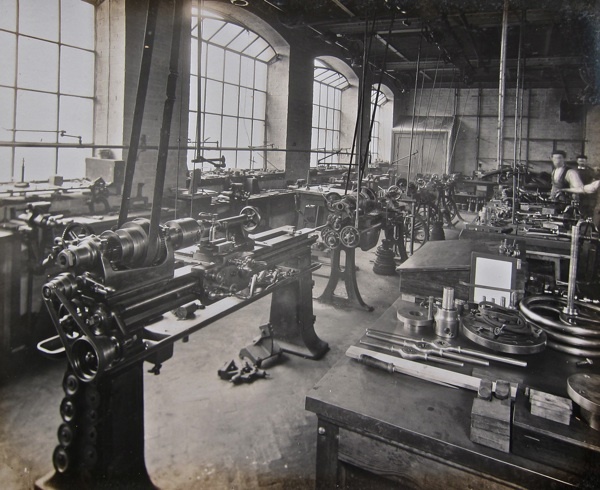 Another view of lathes in the Machine Shop. Type store with fonts being made up into packets. Type matrix and mould store. Metal store with boy hauling pigs upon a trolley. 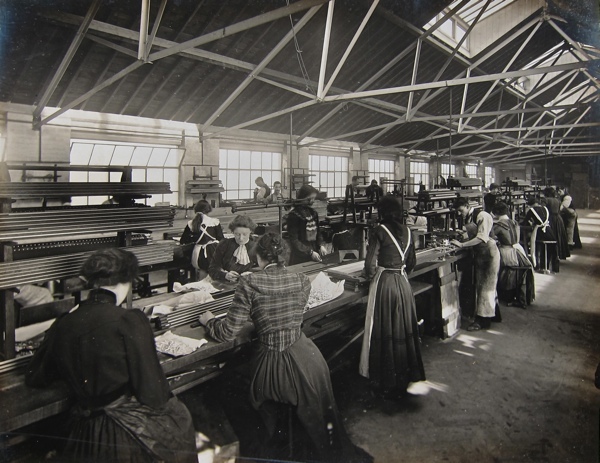 Casting Shop, with women breaking off excess metal and rubbing the type at the window. 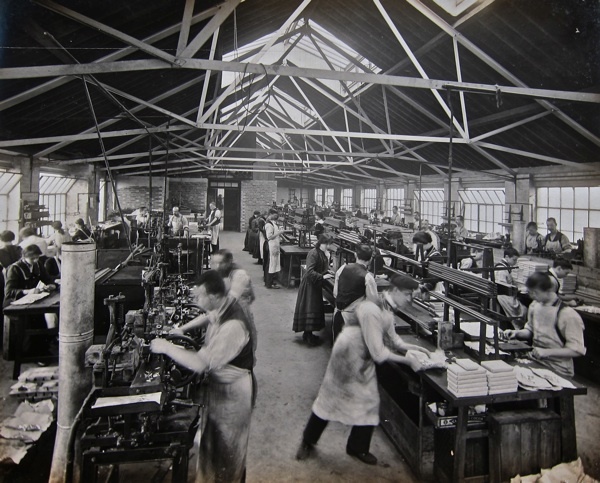 Another view of the Casting Shop. 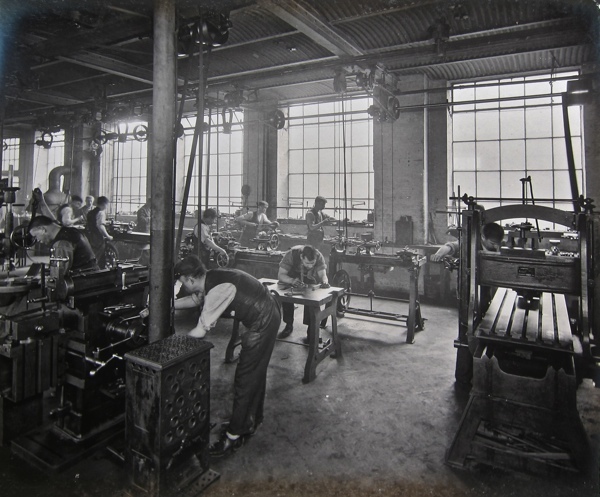 Founting Shop, with women breaking up the type and a man dressing the type. 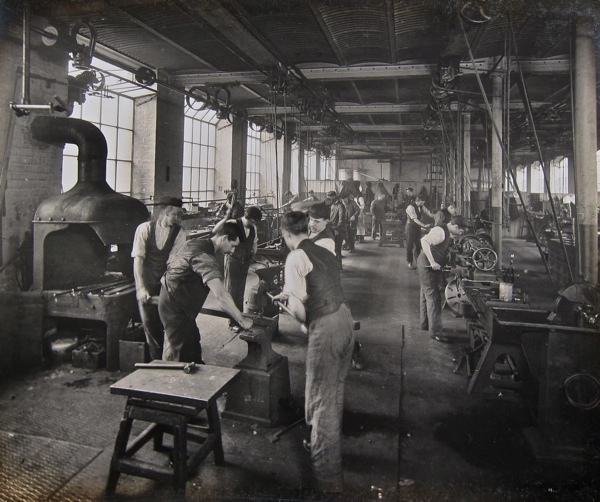 Boys at work in the Brass Rule Shop. Boys making packets of fonts in the Despatch Shop, with delivery van waiting outside the door. 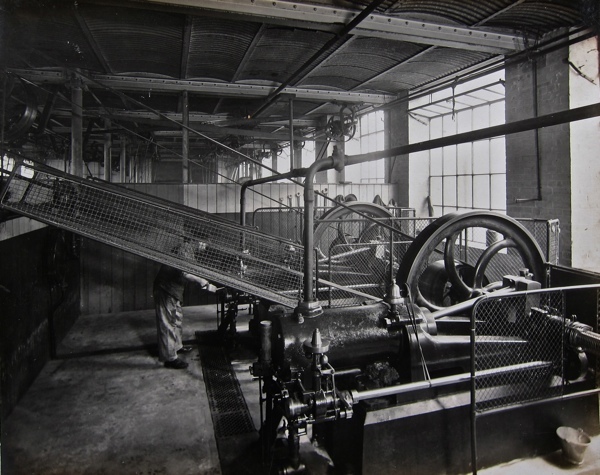 Machine shop on the top floor with a fly-press in the bottom left. 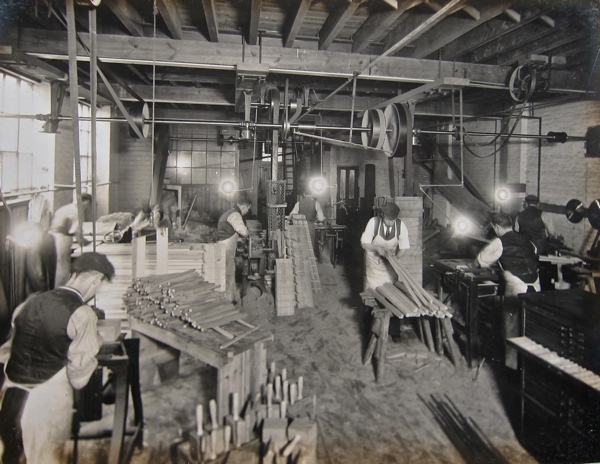 Brass Rule Shop, hand-planing the rules. Caretaker’s cottage with caretaker’s wife and the factory cat. A fascinating glimpse into how things were done. And to think, so much of that labour and effort has been replaced by simply selecting and changing elements on a screen! The old ways living on in the terms used – font names, ‘pitch’ etc. – and these photographs. 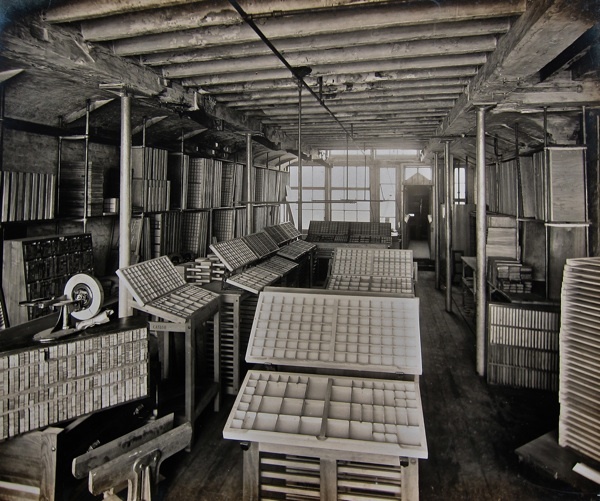 Terrific set of photos, especially for those of us who still print using real type! Many thanks for putting these up. The language has changed since type turned from being a piece of metal with the mirror-image casting of a letter on it, into an image on a screen. The package is a fount of type – ‘fount’ is a quantity, while the image from it shows the letter-form, or the design. A ‘font’ is something a computer uses and now means the design of the image. Those of us who practice the craft still use the language in its original sense. 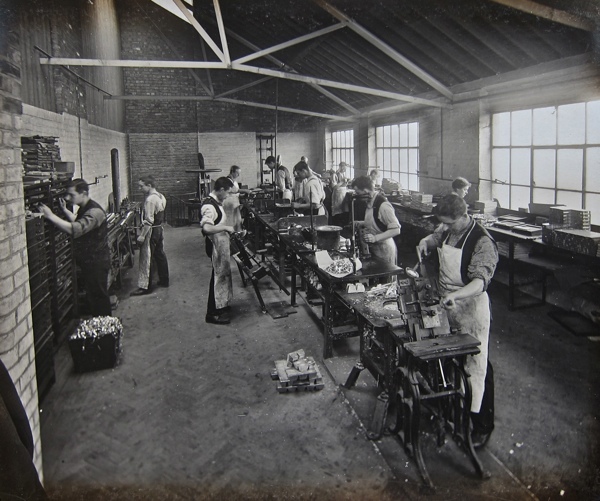 My father and grandfather were compositors setting type on the Daily Mirror and other newspapers. 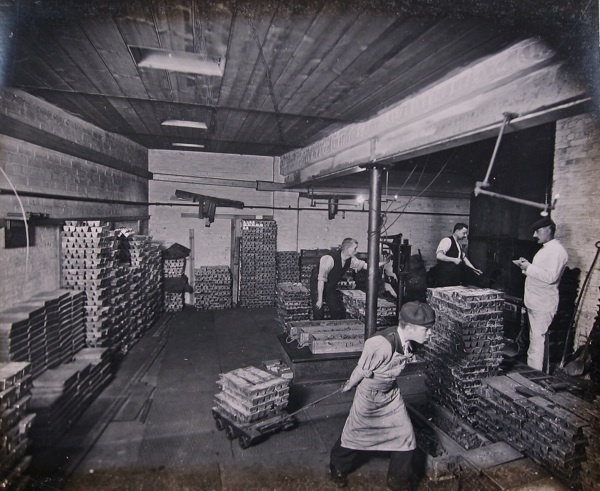 It is amazing to see so many photographs of this old firm and the jobs that were done. 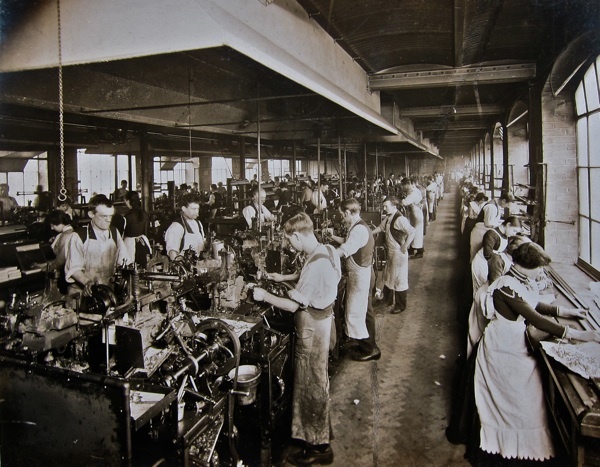 Perhaps we forget how hard people worked in those days. I still have my old caste-off tables and rue the day when the art of typography was dismissed as the ‘old’ way along with hot metal. With the infinite control that digital typography offers there is no excuse for the appalling examples we see today. Good typography starts with the love of the letterforms and I remember being made to trace Caslon over and over until I could do it without reference to the type sheet. Wonderful glimpse of an almost-lost world. It reminds me a little of the hours I spent as a child with my John Bull printing set. The time it took to make a simple headline and short ‘news’ article! So different from the things my grandchildren are able to achieve at the computer…. but more fun too, perhaps. A very interesting article. I work in the web industry so have to know a bit about fonts. Using the wrong font, or an inappropriate one (comic sans!) can ruin the entire look, style and feel of a site but clients sometimes don’t get it so you have to try to steer then down the right route. You would not believe the amount of times we have to tell people that comic sans isn’t acceptable, at one point there was a campaign to rid the world of it. For more about fonts I’d recommend an excellent book called “Just My Type” by Simon Garfield – it has a brilliant chapter on Edward Johnston, who designed Johnston Sans for the underground. I saw the last vestiges of this industry on a visit taking students to the Oldham Chronicle in the 1990s. One hot-metal machine remained for the late news while the word-processors occupied a tiny corner of the original room. 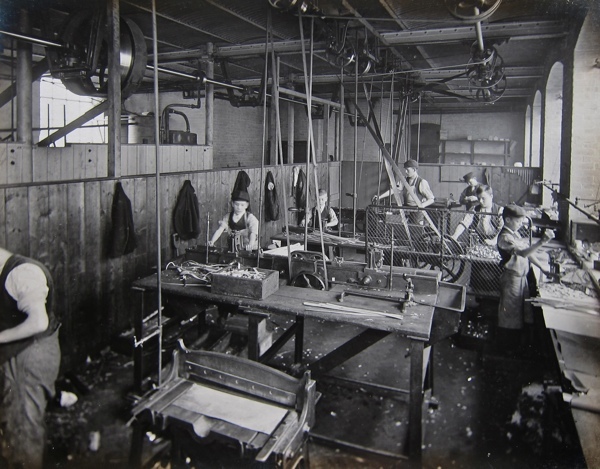 But the men in the print room assured me they would be returning to the old ways because the new ways of working were too difficult! I didn’t have the heart to say otherwise. I “see myself” in one of those photos- albeit 60 years later… In 1967, I was the boy pulling the dolly of pigs back to the composing room after casting fresh pigs from old Linotype metal at a small publishing house here in New Jersey (USA). Now – at 63, my life is spent as an “old” letterpress printer – still printing – but now also spending about 20% of my time passing on the skills to a new generation of letterpress printers who actually find this old man’s knowledge and experience helpful. And this is after 20-30 years of believing that my knowledge and skills were as obsolete as the hand-type and presses I print with. This is a wonderful retrospective of how things were in the past. 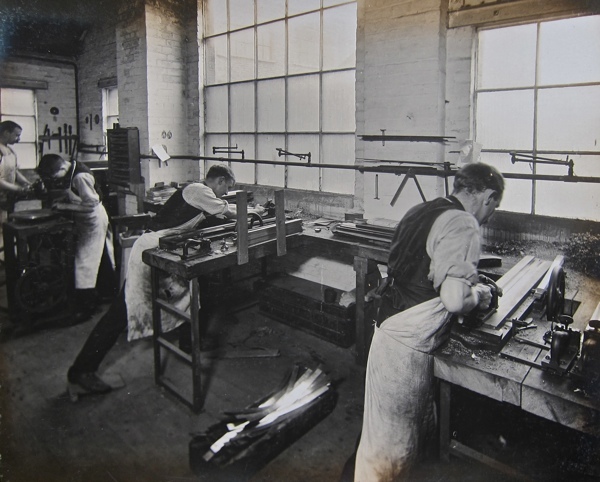 I found the photos fascinating and am so pleased that someone took the time and made the effort to document the work done at the Caslon foundry. I only wish that more printing and support establishments had documented their operations so well. Which reminds me – I ought to do the same with my shop, too. It’s often referred to as a museum – and it is. 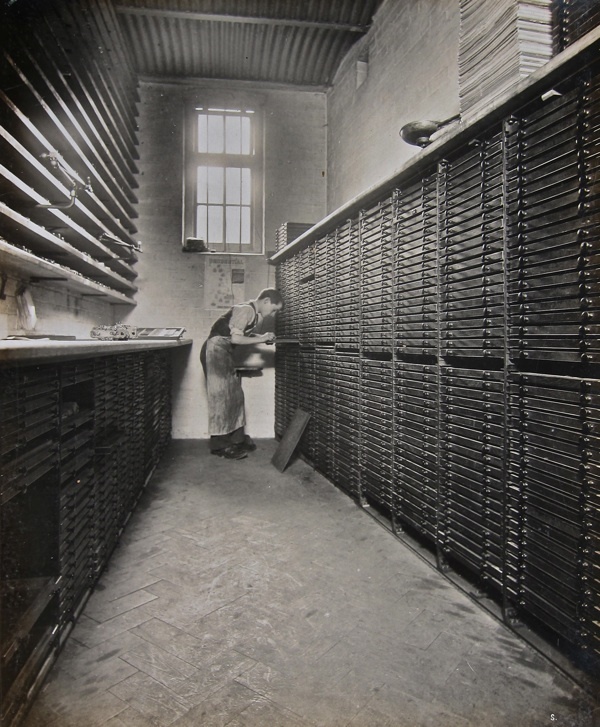 I still use the same tools – hand type and presses, Ludlow slug casters and even a Linotype and an Intertype- as were used during the period from 1880-1970…. I even have some of these old fonts – still in wrappers – that were cast at the Caslon Foundry so long ago. Thank you for preserving the past for us to learn from and enjoy. How neat the work space! Are there Caslon family in similar business in this present day? Alan – you’re not old at 63! and your skills definitely have a place today. So heartwarming to read that 20% of your time is spent passing on your skills. 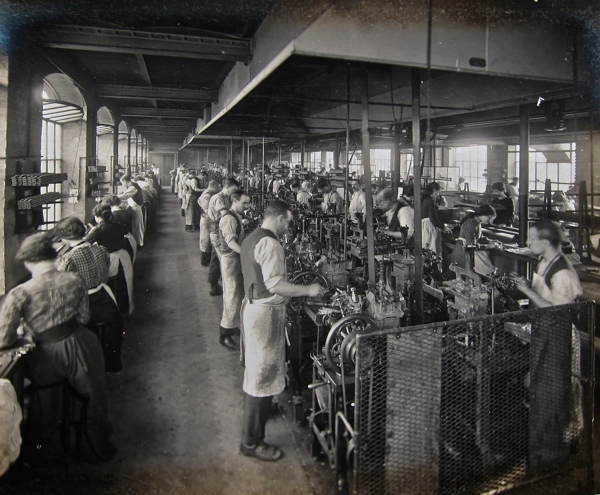 Hooray, lets keep alive these old skills, now a specialised market. There’s always a place for ‘special’, and this is certainly special. Anybody who loves these stunning photos must visit, or at least look up, the Plantin Museum in Antwerp. 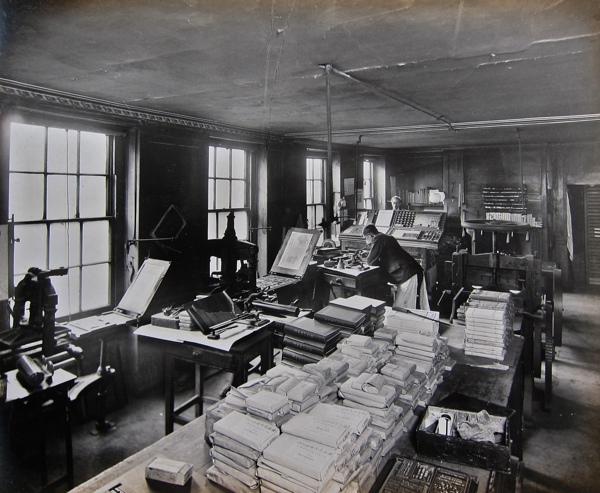 Still in the original premises of Christopher Plantin (c1520-1589) it looks much like the Caslon establishment, showing how little printing and typefounding changed from the time of Gutenberg until 1860, or even 1960. M. Gerstenberg in Darmstadt, Germany, still casts type. Visiting the Plantin-Moretus museum is a fantastic experience, but visiting Gerstenberg’s type foundry is something one will never forget. Blei bleibt! 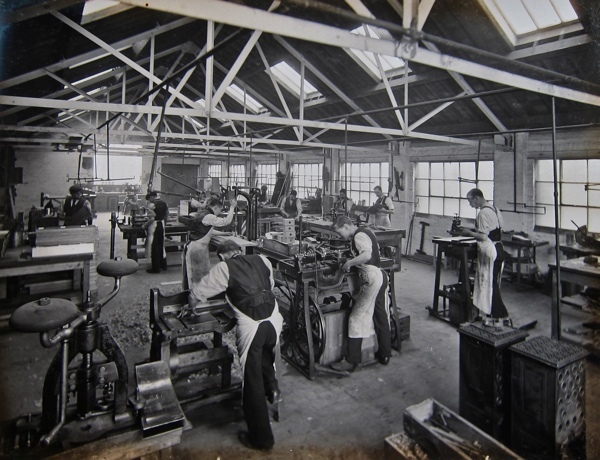 Really amazing photo’s and we are so close to to what was the heart of letterpress type manufacture and printing. It brings to life some of the comments from some of the fabulous printers that I have bought type from about their early days in the trade. Good photo collection, and with photgraphy so young as well at that point operations much older are only remembered in paintings and prints. 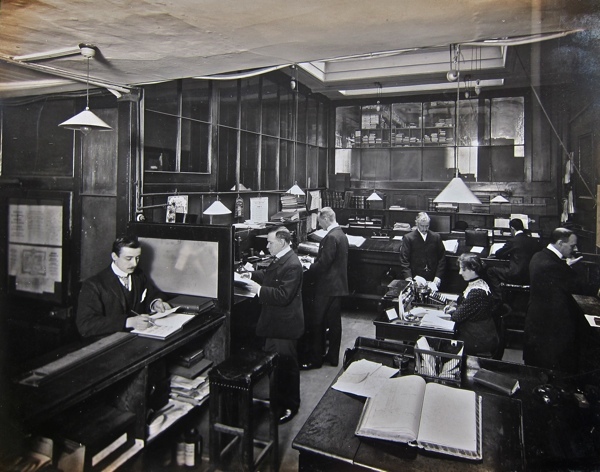 This was the IT industry of the day and was a key trade in any larger city or civilised outpost. The social reformaion of Europe staarted with literacy brought on by affordable reading material. 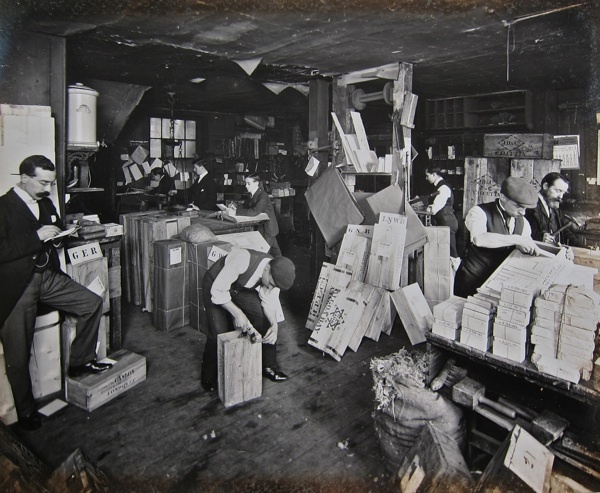 While Gutenberg may not have been the first or only printer the western alphabet and moveable type certainly made the faster spread of knowledge a reality. While only recently involved with Letterpress I have a soft spot for old machines and some of the machines from this era are still in opertion and way past the 12 month guarantee we feel happy to receive from a modern manufacturer. 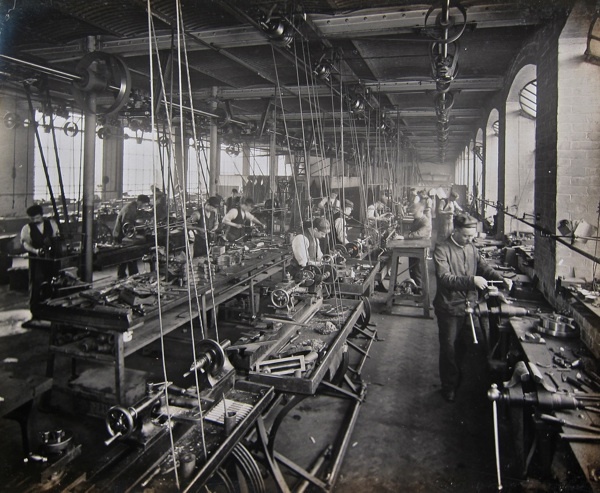 Work conditions then were harsh but modern society has overshot with a the need for speed and regulation that will cause heartache for humanity before a balance is found. Mi más rendida admiración por este “monumento tipográfico” que representa la fundición Caslon. Las fotografías son magníficas y ayudan a preservar la memoria de la imprenta de la era del plomo. A mi me han conmovido y emocionado. Muchas gracias por compartirlas en la red. Astonishing! Thank you for posting! That is history!! Thank you for all that work. I will link the blog to my own small effort on traditional type! So few people appreciate the, skill, time, effort and knowledge that was employed in designing and casting a fount! Fascinating stuff, but I think you would have had to go to the Adobe factory to get packets of fonts, Caslon and the others of course, sold packets of founts. The one for baptizing babies, the other of course was the fount of all knowledge. Nevertheless many thanks for these delights.